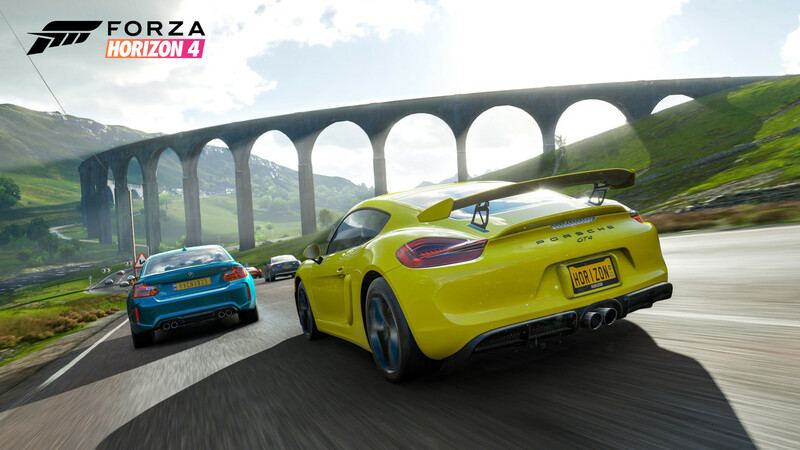 Baz speeds through the beautiful British countryside in Forza Horizon 4. Although I grew up playing car games, I fell off the genre over the years. I am obviously not the only one. There was a period when racing games were one of the biggest genres in gaming – now, it seems to be far more niche. Case in point, in its heyday in 2001, Gran Turismo 3 sold almost 15 million copies, compare that to Gran Turismo Sport in 2017 which sold just over 3 million copies. Yet, despite this, for the past six years there has been one racing franchise that - no ifs, ands, or buts - you can bet I would be playing: Forza Horizon. 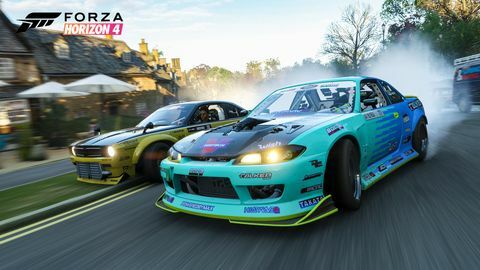 From day one, the Horizon series seemed to capture the magic of early racing games like Need for Speed, while bringing the genre into the 21st century with the technology of the Forza franchise. 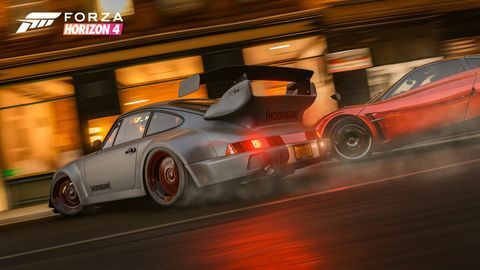 Unlike many of the niche racing games of the last ten years, these titles understand one very important central tenet of successful racing games – they should be fun! 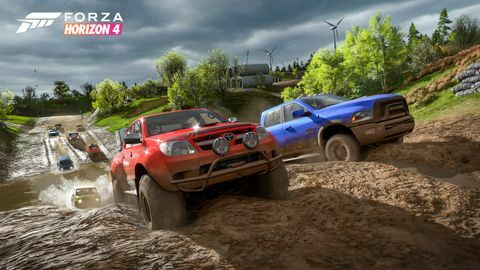 With the past three entries, the series has consistently surpassed the lofty heights of its predecessor – and Forza Horizon 4 is no exception. 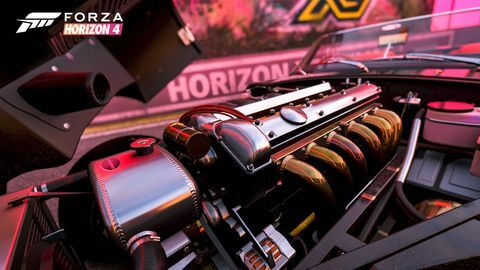 Whether you are hoofing it around the British countryside, battling it out in a fierce race, or modifying your vehicle – whatever your tastes, there is a smorgasbord feast of delights to be had in Horizon 4. After traversing the world, from America, to France and Italy and then down-under to the Australian East Coast, the series is finally returning home – now exploring the same British countryside where developer Playground Games are based. Though not always as visually or geographically distinct as these past locations, there is an undeniable charm to zooming around the British countryside and towns. Especially because of the games stunning visual detail - from quaint English villages to the cobblestoned streets of Edinburgh, the game looks and feels just right. What the setting lacks in geographic diversity, the game delivers in spades through its season system. Building on the Blizzard Mountain DLC of Horizon 3, the game features a cycling season system which allows you to drive in the diverse visuals and terrain conditions of the summer, autumn, winter and spring. It is testament of the keen design vision of Playground Games, that they would think to balance the relative plainness of their setting with a system which would keep it a dynamic environment to explore. Each of the seasons brings with it a striking new aesthetic, as well as new advantages and disadvantages for driving. The most blatant of which is winter, which dumps layers of ice and snow across the rolling hills and villages. As I progressed through autumn, I found myself dreading the idea of entering winter – worried that it was going to make handling and speed a chore until I progressed into spring. Though winter does change the feel of handling, Playground has done a great job of presenting the physics involved with icy conditions, without undermining your feelings of control and ability to floor it. driving feels like a magical balance between realistic physics and the kind of balls- to-the-wall power fantasy that you get from driving comfortably at 250kmh through commuter traffic. This is just one example of a multitude of ways Playground have balanced this game just right. From terrain types, to spatial physics, to the plethora of ways each vehicle interacts with these systems – every facet of the experience feels like it has been given thorough attention and fine-tuned for the best experience possible. Take, for example, a car like a Pagani Zonda – a supercar designed to mitigate airdrag and increase downforce for better handling. It is one thing to put an avatar of a car in a game, and a whole other thing to replicate these various physics implications of each cars’ design. Yet, you can see and feel the effect of these elements while behind the wheel of each car. Driving the Zonda at 230kmh around a country lane, at each turn you can see the principles of the Bernoulli effect at play as the car uses the air to pull itself closer to the ground. The game includes an enormous range of cars from throughout history - yet, it doesn’t matter if you are in a supercar, or some boy-racer dunger, each car feels distinct based on the design and specifications associated with it. 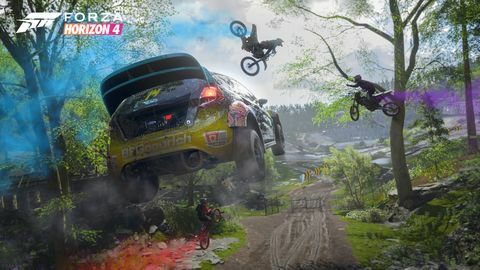 What is more impressive is that Playground manages to not let the game feel too grounded by this realism – somehow, driving feels like a magical balance between realistic physics and the kind of balls- to-the-wall power fantasy that you get from driving comfortably at 250kmh through commuter traffic. 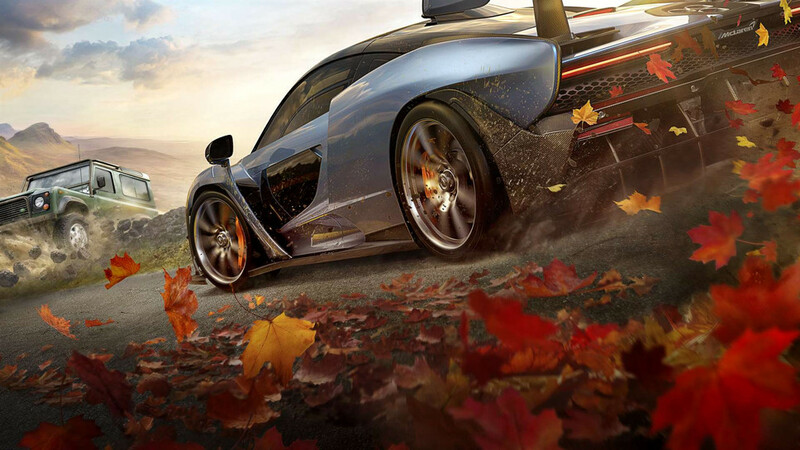 This translates into all the different ways you’ll be driving in Horizon 4 – including exploration, racing and the games signature showcase events. The games racing suite has something for everyone, from street racing to intense dirt racing. Personally, I am a big fan of the cross-country races, which present a thrilling point A to point B slog against 11 other racers. For my money, these races offer a best-of the Horizon racing – allowing you to experience the thrill of hoofing it over a landscape, but through a curated path which is designed to be diverse and fun throughout. each car feels distinct based on the design and specifications associated with it. Aside from traditional racing, the biggest thrills often come from, what you could call, the game’s story content. 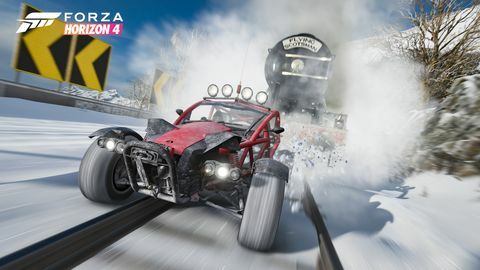 Whether it be the stunt driver storyline, or one of the games showcases, it is a consistent blast to have the game offer you an interesting car in an exciting, and often bizarre, scenario. For instance, the very first showcase pits you against a hulking hover machine in a dirt buggy through a rugged cross-country sprint. These scenarios tap into the kind of car-fantasy that shows like Top Gear have found success with and are sure to get the blood pumping and leave you with a bloody great grin on your mug. If you don’t feel like engaging in these events, there is always the option of simply driving around and interacting with the range of activities included in the open world. Personally, I get annoyed by some of the ‘collectibles’, such as the hundreds of fast travel and influence boards which you can crash into. Thankfully, it is easy to switch those indicators off in the map and focus on the content you do enjoy. For me, that is the danger zones and speed traps, which highlight opportunities to drive as fast as possible through an area or jump from cliffs with as much distance as possible. 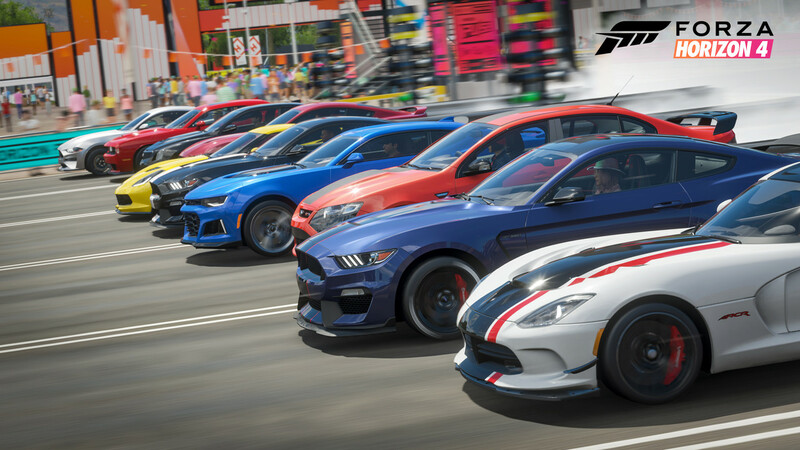 The Horizon series is a masterclass in open-world racing games – utilising the franchises superb technology to create an experience which artfully balances realism and fun through the broad range of experiences it has to offer. 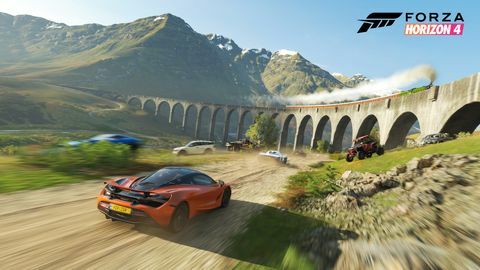 Forza Horizon 4 has continued to refine this brilliant experience, not only through all its technical prowess, but by highlighting that the most important thing is that it is fun.